If you’re a freelancer or small business owner, you might be familiar with Thumbtack. 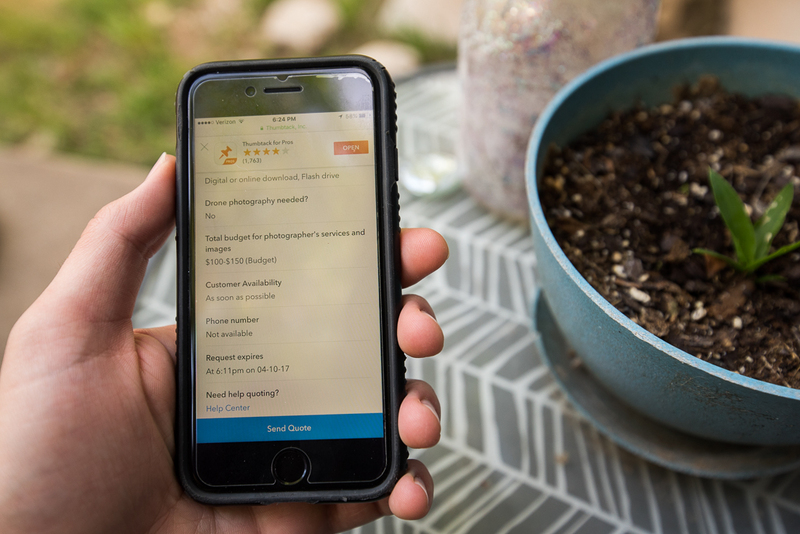 Thumbtack has recently undergone changes in its bidding system, in which professionals only pay when hired by the Thumbtack-referred customer. The feature at hand kicked in for me (and for many other professionals, I’d guess) when Thumbtack contacted me in late 2017. 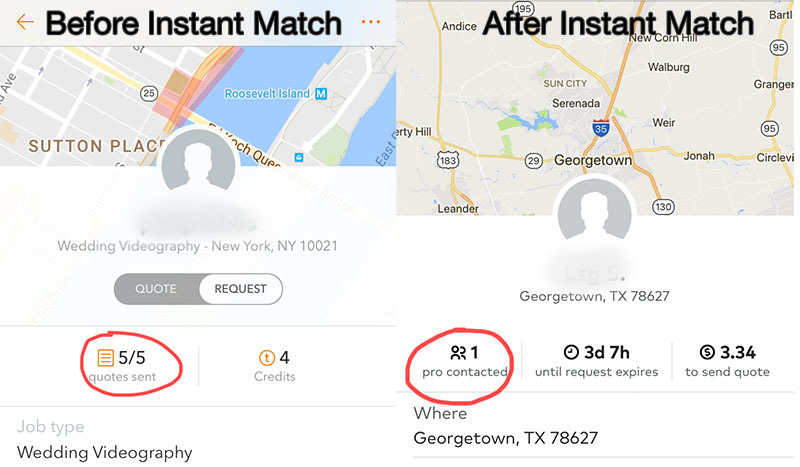 They proposed a new program called Instant Match, allowing professionals (referred to by them as “Pros”) to send out automatic bids to clients any time a request is made, only being charged when actually hired. I liked where the idea seemed headed, and told Thumbtack that their new Instant Match program seemed promising. Pros waste tons of money on bids that go nowhere, and many of us have even suggested a similar adjustment to Instant Match in the past. These suggestions have shown up in various blog posts and complaint forums. The Instant Match idea on principal makes sense: Pay when you get hired, not for the chance you get hired. In early 2018, Thumbtack rolled out the Instant Match option on select services. For instance, of the several sub-categories of photography work I receive requests for (event, portrait, etc), as of now architectural photography is the only category where Instant Match can be turned on and used. When I quoted on a recent architectural job (the old-fashioned way), I plunked down my hard-earned cash only to see something I had never witnessed before on this platform: Thumbtack had increased the bid limit from five professionals to 15. That’s right, 15. If a requester complained about not having enough options, chances are they either wanted to see more bids because they knew there were cheap options out there, or their listed budget was so low that nobody wanted to quote in the first place. Either way, studies have shown that presenting too many options to people can be overwhelming and inhibit a purchase altogether. ThumbTack could now very well be shooting itself in the foot because by barraging a requester with a slew of bids. The customer could be more likely to become overwhelmed and throw in the towel, leaving both the professionals and Thumbtack in the lurch. I’m sure ThumbTack will be watching the new data, and the numbers will tell if Instant Match helps with hire rates or not. If you understand that cost and competition are the two biggest business challenges, then you understand why this increase in competition is a problem for professionals. I’ll get to the cost shortly.. But first, why did ThumbTack make this drastic change? It’s a good bet that ThumbTack increased the maximum bidders per job this to ensure that at least somebody gets hired, ensuring revenue for Thumbtack. Of the 15 quoting on a ThumbTack posting, surely one of the bids would be low enough that the customer would accept it. I did some research and learned that ThumbTack is now charging as much as four times or more than their previous prices for winning bids. That part does make some sense: If only one professional is being charged (compared to every bidder in the past) ThumbTack needs to make compensatory charges in order to keep its lights on. One could argue fairness, but the cost for a winning bid still seems unreasonable – I read in a complaint that a Pro was charged $45 for one winning bid. A) ThumbTack increased the bid limit (in my opinion) unreasonably to 15. B) They failed to notify professionals about this change. C) ThumbTack also removed the “1/5 professionals contacted” widget on the job request screen (see image below) which used to show the maximum number of professionals allowed to quote. This removal seems suspicious to me. Are they hoping that those who are still paying-per-bid will not become aware of the large pool involved (15 pros)? After all, why would any Pro want to pay for a lead if the chances of a hire were so slim? As I mentioned before, professionals still have the option to use the old pay-per-quote system, but the stakes are too high to bid outright and the newer option still leaves us with an unacceptably low chance of hire. Instant Mach leaves professionals with little option for those quote categories in which Instant Match is an option: Either spend your money and have a 6% chance (or less, many customers don’t hire on the platform at all) of winning the bid, or turn on Instant Match and join the ranks of mass free-ish bidding on one request in hopes that the customer responds, in which case you will pay roughly 4X the normal bid price. In both cases, you have at best a 1/15 chance of getting hired. Those aren’t acceptable odds. Many Pros have been baffled and offended by ThumbTack’s responses to complaints about the update. The sad reality is that these days ThumbTack seems to be giving preferential treatment to the job requestors over the Pros. While the requesters are technically labeled on the platform as “customers,” ThumbTack’s real customers are the Pros, as that is the sole source of their revenue – Pros bidding on jobs. If ThumbTack wants its business to thrive and not alienate their true client base (Pros), they should create policies and implement new, more sensible features that help professionals, instead of updates that instigate more long odds and lowballing. Lowball requests have always been an issue on this platform, as with most other similar gig sites. The new model of Instant Match incites an even faster “race to the bottom” scenario. I know this for a fact because ThumbTack gives professionals anonymous data about the other professionals who are quoting, showing your competitors’ response time and prices. The Instant Match system reminds me of utopian idealism. People want to believe this in a revolutionary, fairness-based system, but its cracks begin showing up quickly. Before long, the truth comes out that the powers that be are still mainly acting in their own self-interest, regardless of what they say to the public. In all fairness stand by my previous statements in past articles that Thumbtack isn’t actually a scam. I’m sure for many, it’s still a somewhat reliable system to at least supplement business leads, but I am skeptical about its future at this point. If you want to generate organic leads or lower-cost ones, I suggest either hiring someone to do SEO for you, or learning it yourself. If Thumbtack or any other Pros would like to respond to this article, I encourage them to do so in the comments section. I agree 100%. After using the site with great success for 2 years, I noticed that in May 2018, I wasn’t getting hired anymore. I did not want to use Instant Match because I prefer to only bid on large corporate jobs of 75 people or more (I’m a caterer) as opposed to say, a small birthday party with 15 people. So I prefer the manual quoting system. But since I wasn’t getting hired anymore, I decided to investigate the whole Instant Match process and made a test request as a customer. I instantly recieved 7 quotes. Then, 20 minutes later, I received the job request as a pro. So, the customer gets 7 quotes instantly, then 5 more quite a bit later. As a customer, they have 7+5 = 12 QUOTES. No wonder I’m not getting hired anymore. The odds are so low, as you said, of getting hired. I thought about trying Instant Match so I’d show up instantly for the customer, but read some reviews online first. I’m glad I did. It looks like I’m done with Thumbtack. If I’m not getting hired, or have to pay an insane amount to get in front of a customer who I didn’t even personally choose to bid on (like jobs that are small) then there’s no reason for me to use the site. As a pro, I would’ve been willing to pay more for a quote IF there were only 5 pros quoting. But I am not willing to pay to be one of 12. Thank you for sharing your experience here, Renee. I’m sorry that you had a similar experience to mine. It’s a shame, as Thumbtack had so much potential in the past. It definitely allowed me to grow my freelance business in the beginning, before I had much of a marketing plan put together. As an update, I did book one gig while bidding against the Instant Match system to my surprise. The good news is that although there is higher competition, many of the new Instant Match quoters have no reviews/weak profile and are in the system since they have little to lose but exposure to gain. Perhaps that’s a plus for me, but I can’t say it would be the same across every industry or even category. If Thumbtack does read this, I urge them to reply and give their two cents. I don’t mean to bash the company, this is just an honest critique from a loyal pro who has spent thousands of dollars over the years advertising my service on their platform. Renee, thanks for sharing your experience. You mentioned 12 quotes being sent to the customer but if your industry is set the way mine is on the site, that’s not the limit. It’s 15 (at least for photography). Sorry to hear that you’re in the same boat. There are better marketing systems out there, if you ask me. Good luck and thanks for reading! I put jobs on thumbtack all the time and I agree and disagree on certain things. 1) thumbtacks customers are just as important as the pros since with out customer pros don’t have anything to bid on. 2) instant match. To be honest I never hire instant matches. Why? Fakes me out, looks like a canned response and I’m looking for people who want the job. 3) as someone looking to get into selling photography I thought this would be a good place to start. But this is somewhat discouraging but I will probably still give it a shot. At the end of the day. In my mind the only pros on here are ones that are not good at sales and marketing. That is the price you pay for being in a market place. If you want high paying jobs, you will have to do sales yourself for pay someone commission do it for you. I hate to agree with you, but #3 in your points is true for the most part. IMO, Thumbtack is most useful for people who need to market/advertise themselves but have no idea how to do it on their own and save money. Thumbtack was a great source for work in my commercial cleaning business, but they became so greedy that now its a joke. When you shop around do you go to 15 different places to find the best deal??? They allow 15 companies to compete for one customer. I couldn’t agree more, Dejan. But Thumbtack doesn’t charge for winning a bid. They charge when the requester sends you a message through Thumbtack. I’ve been charged as much as $65 because a requester asked what kind of camera I used after not reading that exact information that I had included in my original quote. Also, Instant Match is not available to me for most of my service categories, but it sure seems available to other pros in those categories. You’re correct Brett – they don’t charge for a winning bid but for a response. That’s part of the issue. It looks like they’re about to roll out an even new service. Make sure to check back, as I’m sure I’ll be covering it once I try it out. Thank you Scott for taking the time to review Thumbtack. We too have been very successful in the past using Thumbtack for leads. We moved to a new area and I was setting up my account for the move and noticed the changes. After having Thumbtack change my weekly budget for me, I started checking into exactly how the Instant Match worked. We are a Drywall Contractor and Thumbtack wants to bid the jobs for us, there are so many variables in our industry there is no way to give an exact quote without, at the very least, discussing the work with the client. We usually set up a free appointment to visit the job site before quoting. So this program is going to give Thumbtack a bad name, as Pros will give a low ball price to get the job and then tell the client that the price is not right, due to more work needed on the project. Will create a bad experience for the client who has budgeted for the lower price. And just as an after thought, I to would have been willing to pay a bit more for leads, had they not changed the playing field. Thanks for sharing your experience, Marji. I hope Thumbtack figured out a system that works for your business. Well written and concise review. The issue with TT is that tire kickers with no skin the game are making paying pros look like beggars. Leads that I would delete in the old system are now treated like the Messiah at Thumbtack. A lead loses value the longer it sits with nobody replying to them. TT now puts them in the driver’s seat and let’s them answer questions prepared by TT. and answer questions provided by TT. Vague and broad questions that realistically do not pertain to my business. All leads have to do is push a button that says when is the pro available and that pro gets charged. The lead is never told that by doing that they will be contacted by a pro. They are just poking around. It’s like everytime a pro turns around some bum is handing TT their money. Nope not me. The real consumers are the paying pros. The question is when is TT going to get into bed with it’s paying customers. This system allows TT to create money out of thin air. Very abusive and in my opinion fraudulent. Hi Gabe, thanks for reading and sharing your comment. I was under the impression that the pros are charged when the lead responds, not when they push a button regarding availability as you mentioned. Can you elaborate on that?